City of Bones by Cassandra Clare revolves around a 15-year-old girl, Clarissa Fay (aka Clary). Clary and her best friend Simon witness a murder while at a nightclub, and for some reason Clary is the only one who sees the murderer, a teenage boy named Jace, who claims that the person he murdered was a demon. Clary is told by her mother not to return home for reasons unknown at the time. She assumes this is a call for help and does the opposite of what her mother requested. When she arrives home, she finds that not only is the apartment trashed and her mother is missing, but a creature (demon) is waiting for her. Clary manages to defeat the demon, is hurt in the process, is rescued by Jace, the boy from the nightclub, who is a Shadowhunter (aka demon hunter), and taken back to his home at the Institute, a gothic looking cathedral that is invisible just like Jace. Most things in the Shadowhunter world are unseen to normal humans (aka mundanes) by magic. It is here that Clary meets Hodge Starkweather, Jace’s tutor and his adoptive siblings, Alec and Isabelle. Hodge along with the aid of monks titled Silent Brothers, Jace, Simon, Alec, and Isabelle discover they mystery as to why Clary, a mundane can see Shadowhunters. They discover that a block was intentionally placed on her mind as a child when her ex-Shadowhunter mother asked Magnus Bane, the High Warlock of Brooklyn so as to shelter her from the sight that gives people possessing the magic the ability to see the Shadowhunter world and rather hoped her daughter could live a “normal” life. When Magnus Bane is confronted to restore her memories he states he’s unable to do so but with Clary now aware of the Shadowhunter world, her memories will most likely return in time. When Clary discovers the whereabouts of a magic relic while drawing in her sketchbook, they all attempt to retrieve the Mortal Cup, are attacked by yet another demon in which they are rescued by Magnus Bane. Once the Mortal Cup is in Hodge’s possession he admits that he has been all this time deceiving them and working with the evil and presumed dead Valentine, who is actually Clary’s father. After Jace is kidnapped by Valentine, Luke, a close friend of Clary’s mother and a Werewolf assists Clary in raiding Valentine’s lair, where Clary is able to located Jace and Valentine, learns that Jace is actually her half-brother and mortified about the thought of their love for one another. Valentine escapes to Idris, the capital of the Shadowhunters with the Mortal Cup in his possession, one of the three Mortal Instruments gifted to the first Shadowhunter from the angel Raziel which can be used for good or evil. Clarrisa Fray (aka Clary), the protagonist is about to turn 16-years-old. She lives with her mother Jocelyn Fay/Fairchild and is looked after by Lucian (aka Luke) Garroway. She’s lives a normal life entirely unaware of her mother’s connection as a Shadowhunter. As an artist she has learned to use her talents as her way to vent her emotions. Oh, and she does have powers that the reader will learn later in the series. Jace Wayland, Clary’s romantic interest, introduces her to the magical side of the universe and a place called the Institute where Jace’s other Shadowhunter adoptive family lives (Alec and Isabelle). Her best friend is Simon Lewis, and Valentine, the antagonist is actually Clary’s father. Clary, Jace, Alec, Isabelle, and Simon all ignite potential relationships, love triangles, and of course, the tween favorite of unrequited love as seen with Isabelle-Simon, Simon-Clary, Clary-Jace, and Alec-Jace. 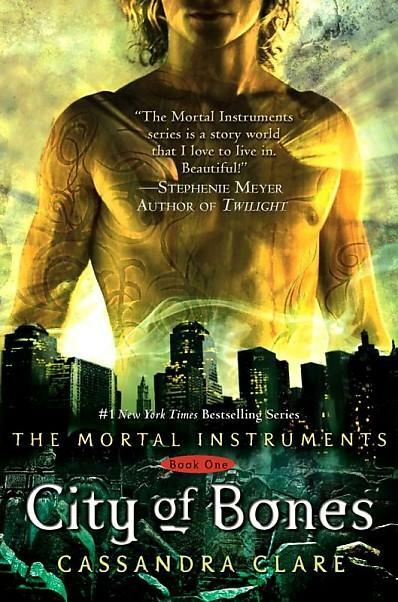 City of Bones is an enjoyably, highly engaging, emotionally charged, and magically filled book that anyone that enjoys paranormal, fantasy, or even dystopian novels will enjoy. The author weaves wonderful imagery into the story’s setting and excels at character development. The protagonist, Clary, is slightly older than the tween age, but City of Bones and the entire Mortal Instruments series by Cassandra Clare will easily appeal to tweens due to high interest and favorable subject matter such as typical tween/teen struggles with sexuality and unrequited love. City of Bones offers tweens information in a fiction setting to learn and cope with adult issues and difficult life choices. Mortal Instruments concurs with the theory that you can’t choose your family but rather can find alternative means to cope. City of Bones address many topics that are developmentally appropriate for older tweens such as relationships, intimacy, prejudices as seen between the Shadowhunters and Mundanes (similar to Harry Potter between the Muggles and Magical folk), grief, deception, false identities, orphans, broken families, friendship, sexual identity, and the traditional humanistic binary between good and evil. For many who were in their early tweens or younger when they read the Harry Potter series will greatly enjoy Mortal Instruments, a more mature fantasy series or even reading The Iron Witch by Karen Mahoney. And, City of Bones is currently in production as a major motion picture to be released summer 2013.